Bifolds with large capacity have gotten a somewhat bad reputation over the years, but if you truly need a high capacity wallet for tons of cards, cash, and other items, this Levi’s Men’s Extra Capacity Leather Slimfold wallet is perfect. It combines a huge amount of storage with a relatively thin profile, and it’s made out of a 100% genuine leather material that’s attractive and durable, and it’s built with a plastic frame that will help it keep its shape over time, avoiding the “squash” factor sometimes associated with these wallets. It closes securely and tightly, and the card slots are tight and hold your stuff fast. You can also remove one of the card slot holders if you’d like a slimmer profile and don’t want to carry around too much stuff. If you want a minimalist cardholder that’s a little different than typical leather offerings, this wallet by Travelambo is just what you need. It’s built out of a high quality textile that incorporates an RFID blocking design, which keeps your smart cards and chip cards secure from those who may try to acquire your information with NFC readers. It has six card slots – three in the front, three in the back, in a two-vertical, one-horizontal arrangement that makes it easy to stay organized. Combined with a large receipt/cash slot that’s accessible from the top, minimalists will love this wallet. It’s lightweight, it’s durable, and it looks damn good, and for those reasons (plus its security factors) we recommend this to anyone looking for a great, non-leather cardholder. 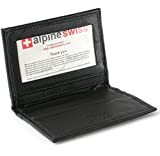 This well-designed wallet from Simpac combines a high-capacity money clip with a unique cardholder design, allowing you to hold up to 10 cards, along with a huge selection of US dollar bills and other currency, while maintaining a slim profile. It also offers a quick access slot on the front of the wallet for your most used card, as well as an ID slot to make identifying yourself convenient. A large capacity card-slot with a pull tab gives you a way to stash away your less-used cards, while still keeping them easily accessible. 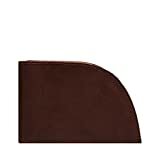 It’s made of full grain leather, and the great, innovative design means that you can store tons of cards and cash in a slim profile that would be impossible with any other type of wallet. Combine this with the RFID-blocking technology that’s incorporated into the body, and this is a great buy for anybody who’s looking to downsize from a larger bifold or trifold, but doesn’t want to spend a ton of money, and doesn’t want to sacrifice storage space. Textiles are in. This attractive bifold wallet is lightweight, due to its 100% polyester design, yet it’s durable and, because of the stretchier properties of textiles compared to leather, it can hold a gigantic amount of stuff while still remaining slim and light. It comes with 8 huge-capacity card slots – we’re pretty sure you could fit at least 2 (non-raised-text) cards in each of these slots, giving you an enormous amount of storage capacity. It’s also got a large cash pocket in the back, so you’ve got plenty of room for bills too. In addition, it features two extra receipt/miscellaneous slots below the 8 card slots, so whether you need to stash receipts, business cards, stickers, or pretty much anything you could imagine, you’ll have plenty of extra storage space. If you like classic bifolds but don’t want a heavyweight leather wallet, this is a great pick. It’s inexpensive, quality, and lightweight. In addition, the classic Herschel-trademarked lining and beautiful color options mean you’re sure to find a wallet that uniquely suits you. Some men just love trifold wallets. And we can see why – they offer great storage in a relatively small profile, and many prefer the way that they fold cash, as well as their top-loading card storage options. If you’re a trifold diehard looking for a new go-to wallet, we recommend this wallet by Tommy Hilfiger. It’s made of a quality leather, and lined with a sueded leather – not a textile, so you know it’s got 100% quality leather construction. The contrast stitching and Tommy Hilfiger logo add a bit of class to this refined trifold, and it’s got plenty of storage features, with 8 interior pockets, a removable photo/business card holder, and two separate interior cash storage slots. Trifold diehards will love its small profile, and this wallet is also perfect for front-pocket carriers who need plenty of storage, as its slim and narrow profile fit better into smaller front pockets than bifolds typically do. Minimalists with a love of quality leather products, rejoice! This wallet by Vaultskin is made of a full-grain Italian leather that’s a pleasure to hold, and it’s designed smartly to allow maximum storage with minimum size and weight. It’s made with a versatile 3-pocket design – one on the front, one on the back, and a large interior pocket. These 3 pockets can be used however you wish, with the front pocket holding 1-2 cards, the middle pocket holding up to 5 (or fewer and some cash) and the rear pocket holding 3. You can stash your cash in any of these pockets, but we do recommend carrying your smart cards and chip cards in the interior pocket, where it will be totally RFID protected. This wallet is as minimal as it gets, but don’t let that fool you. The unique 3-pocket design makes it totally versatile, so you can customize your card-carrying experience, and enjoy knowing that you’ve got exactly what you need, exactly where you need it. The Front Pocket Wallet by Rogue Wallet remains a perennial favorite of ours. It’s totally unique, and designed specifically for men who like to carry wallets in their front pockets, with a curved profile and plenty of lightweight storage. And despite its minimal profile, it packs four total interior pockets, as well as an ID slot and a fully-functional billfold pocket, all of which combined mean it can hold up to 6 cards and a generous sampling of cash, while still remaining lightweight and fitting perfectly in your pocket. Its genuine leather construction means that it will last for years, and the specially cut profile fits perfectly into front pockets, so if you’re a front-pocket-wallet carrier, you won’t find a more specialized product for you. And if you’re curious about moving your wallet to your front pocket, this is certainly a great wallet to look into for the ultimate experience. Passport wallets are often bulky and ungainly, given the large amount of material used to make them, but they’re still very useful when travelling – there’s nothing worse than that heartstopping moment where you forget, exactly, which pocket of your backpack you stashed your passport in, and keeping your passport close to you is essential for your safety and security while traveling. That’s why we love this passport wallet by Herschel. It combines 3 high-capacity card slots with a generous cash slot sized for basically any size of paper currency, as well as a large passport slot, to create a passport wallet that’s lightweight, flexible, and convenient (as well as being quite a looker). If you need a passport wallet, but aren’t interested in a large, expensive leather wallet, this passport holder by Herschel certainly deserves a look. Talk about versatile! Tommy Hilfiger has created a great bifold combination wallet that’s a high-capacity billfold when you need it, and comes with a removable card case for those times when you want to travel light. Crafted out of an eye catching combination of buffalo leather, cowhide, and cotton textile, this wallet is a great choice for you if often change up what you carry with you, and need a wallet that can expand (and shrink) with you. The high-quality leather is stitched together expertly and there’s plenty of storage in the bifold, with four dedicated card slots, a receipt slot, and the removable card holder that can hold about 4 cards, as well as an ID window for your driver’s license. The cardholder is easily removable, and can easily hold in excess of 4-5 cards, so you can carry just your debit/credit cards and ID, etc. if you’re out for a night on the town and don’t want to worry about carrying a ton of cash. High quality, customizable, and convenient, this is a great alternative to more traditional bifolds. Measures 4 1/4" x 3" x 3/8"
This card case is perfect for anyone who wants a minimal storage solution, but doesn’t want to sacrifice an ID slot. It’s built in a unique style, featuring an ID slot on one side and four card slots, as well as a cash slot on the other side. It even feature an external card slot for your most-used cards, making it very convenient, as well as giving it plenty of total storage capacity. It’s built out of a high quality genuine leather, and the ID slot is sturdy, crafted out of a dense, high-quality plastic that’s easy to handle, from which you can slide your ID and other cards in and out easily, in case you need to give someone a better view. You can expect to fit about 5 cards in this wallet, including your ID, and a small portion of cash in the small cash/receipt slot in the wallet. Overall, this is a great cardholder for anyone who likes the bifold style and need an ID slot, yet wants a minimal wallet that’s slim and lightweight. That does it for our quick list of the top 10 wallets for men in 2017. There’s a huge style variety here, and even if you haven’t found the exact wallet for you, these different styles, brands, and manufacturers should give you a good idea of what’s on the market, and point you in the right direction, helping you find the perfect wallet for you. Whether you’re a minimalist, a maximalist, a leather lover, a textile-fan, a traveler, or a young professional, you’re sure to find the perfect wallet.